What is it that grips me about this place by the lake? 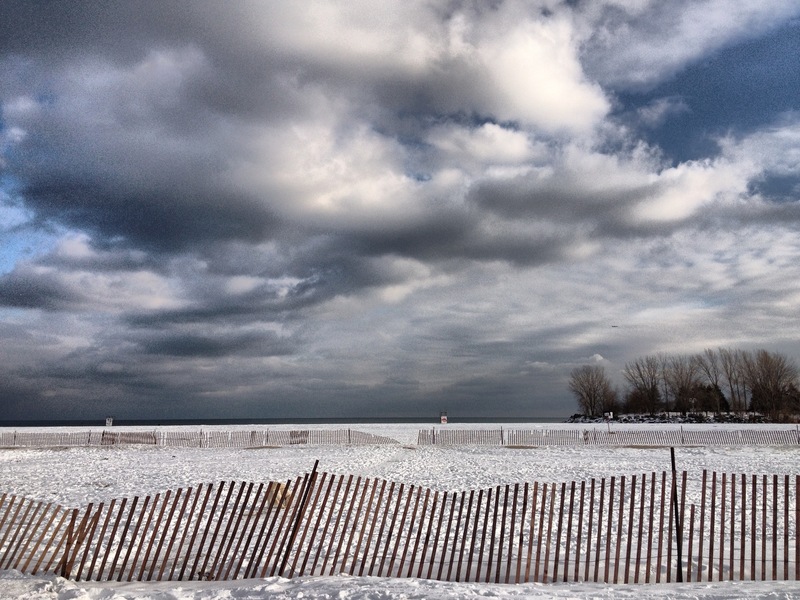 I visit this beach on the shores of Lake Ontario, right on the edge of the city of Toronto, almost daily. If not with the dog – he’s most often my excuse, then just by myself. I’m there to take in the big spacious sky, the long open beach, the contrasts of the white snow and, often, grey skies – although sometimes they’re bright blue. Something about this space, this place, speaks to me. I need wide open spaces. I think it’s from living a jam-packed life. Filled with lots of things – lots of good things, but lots of demands, too. Meetings, and appointments, and obligations, and chores. Wall to wall, sometimes, with things that take more out of us than give back. And, now, in the early, early stages of retirement, (I must say, I still don’t like that word! ), I don’t have that same jam-packed schedule. And, I’m not chasing after one, either. Instead, I am craving space – wide open space around me, in the landscape, and on my calendar. It fills me up, this empty space. This incredible, beautiful, and, at times, haunting, place fills me with joy, and beauty and a feeling, sometimes, of the divine. Here are some of the other photos I’ve taken in this place these past few weeks. I love this idea of being filled up by empty space. Something I could learn from, here in my retirement life. While things certainly aren’t as hectic as the days of raising a family and working, I have still created a daily routine that doesn’t always leave much white space in my day. I really do love this series – the simplicity of sky meeting lake,celebrating the horizon line. In this one, I like the repeated verticals of the fence line, mirrored by the trees in the distance. And again, the beauty of different whites – the snow versus the clouds. I can understand why you have made this part of your daily life. I have so enjoyed these images of this beautiful place, Juli. For me it is easy to see why you get a sense of the divine when you go there. It is so spacious, so limitless, and indeed peaceful. This is such a beautiful photograph, Juli, and I do know what you mean about the wide open space. It simply just feels good, and there seems to be so much possibility there. What a gorgeous winter beach scene. And – I can so relate to this need for ‘space’. Not just physical..expansive..quiet space – but empty space in my calendar.. Days with absolutely nothing scheduled. YES!